Usually when a ski gets retired, that’s a result of the skis edges becoming dull, its bottom getting overly scratched up, its sibling ski getting lost or destroyed or, more likely, its trend-seeking owner simply deciding to get a newer pair. 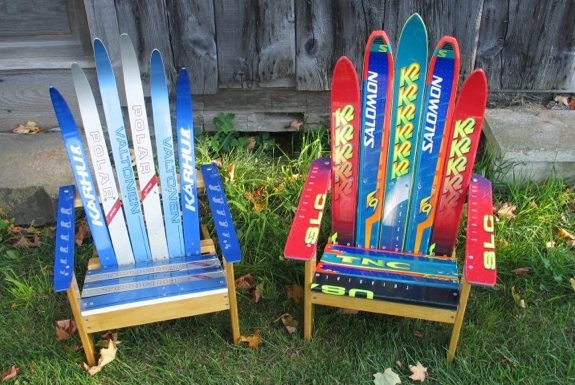 Used, discarded skis are almost always structurally sound — and thus almost always a perfect material for making a chair out of. That’s because skis are designed to withstand heavy forces while also being somewhat flexible, especially towards the front and rear. 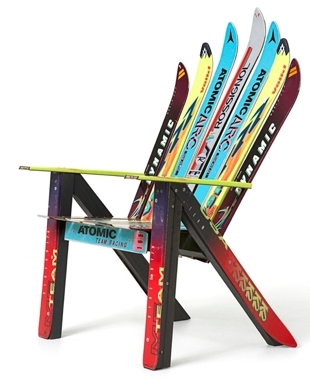 The most common type of chair upcycled from skis is an Adirondack style (pic, below) that uses a wood frame. 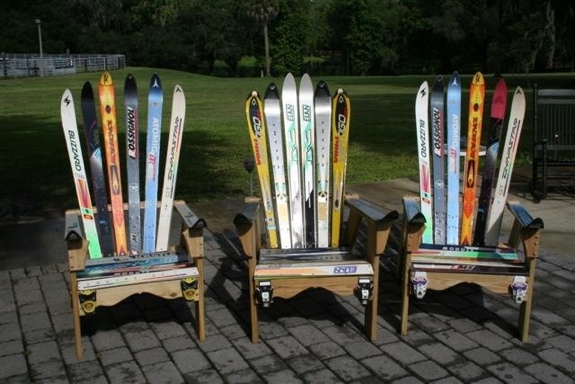 But you can also make other styles of chairs (like the one to the right) using virtually nothing but skis. Tools typically required: Circular saw with a metal-cutting carbide blade, drill, handsaw or band saw, screwdriver. As long as their denim isn’t worn thin (as regularly happens at the knees but not around the thighs and shins), old jeans can easily be reincarnated as cool chairs. In fact, old jeans that have acquired a visually-interesting patina as they’ve aged can make for better chairs than purposely-bought new denim can. 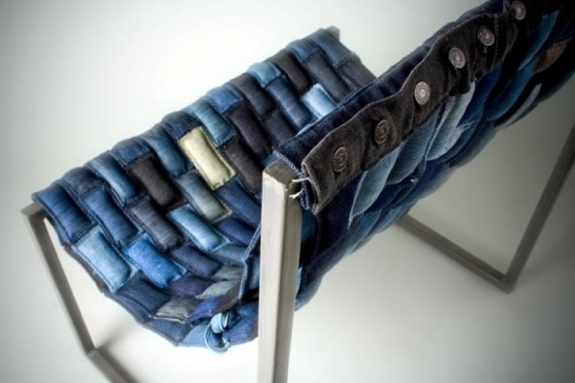 The regular method of making a worn denim chair is to choose another material for the frame. In the pic below, the chair maker started with a steel frame, draping sewed patches of cotton-stuffed denim between the front and back steel bars. If you want to make a chair entirely out of reclaimed materials, check out these instructions for a chair made from denim, cardboard, junk mail and empty soup cans! Tools typically required: Saw, hot glue gun, heavy scissors, sewing machine. If you hope to make a super-comfortable chair in a relatively short amount of time, DO NOT ENTER the world of traffic sign chair making. 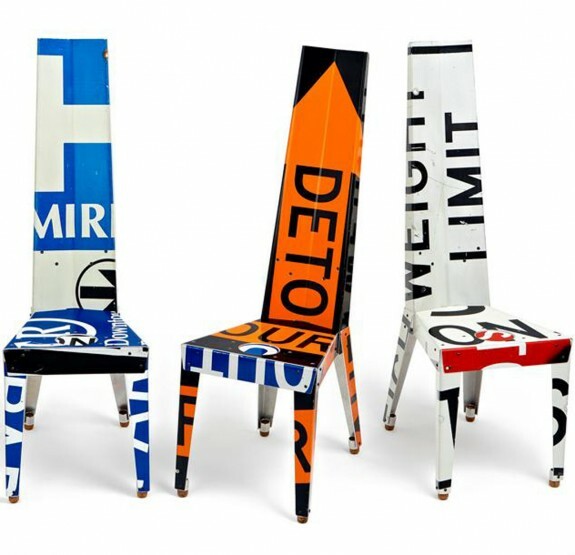 Chairs made from traffic signs, while not necessarily uncomfortable, are not the stuff of lounging around and watching movies either. And, being constructed of metal, you’ll need some skills in blacksmithing, welding and riveting — or an eagerness to learn them. 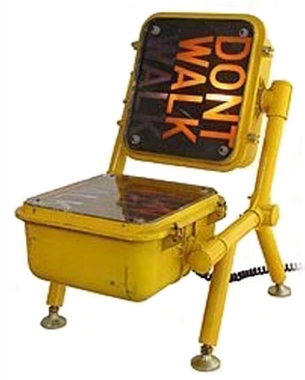 That said, there’s something undeniably cool about a traffic sign chair. They also make for superb outdoor furniture. After all, their heavy-gauge aluminum and steel material is designed to be rust-proof and to otherwise withstand the forces of nature. Please note that there are several stores — brick and mortar as well as online — that sell used traffic signs. Don’t go out and, um, creatively acquire your own. Tools typically required: A variety of metalworking, welding and riveting tools, including a skiving machine, cold saw, punch press, jigsaw and counterbore.